Transcript requests come from two different places: the Profile > Student view and, if enabled, the public form. This option lets the student request a transcript himself. Academic Admins and Registrars can also submit an official transcript request on behalf of the student using this method. Go to the student's profile and click the Student view. Choose a charge method. You can charge it to the student's account, require immediate payment with a credit card, or you can waive the charge by selecting None. If enabled, this option lets anyone without a current Populi login—alumni, for example—request an official transcript. The requester visits your transcript request page. The URL will look something like https://yourschool.populiweb.com/router/request_transcript. You can find this URL in Transcript Requests > Settings under the Enable public... setting. He'll need to enter as much of the requested information to help you match him with the correct record in your system. Alternately, he can log in and use the logged-in user form, which ensures that his request is connected to his record. Once he submits the initial form, he'll be taken to another page where he can enter the request details (recipient, etc.). The Transcript Requests report collects all your students' requests and lets you fulfill them (among other actions). Use the filter to sift the report down just to see certain kinds of transcript requests (ones not fulfilled requested before a certain date, for example). indicates that there's a lock on her account that may affect whether you wish to fulfill her request. Hover over it to see what kind of lock it is; you can see the reason for the lock on the request info page (see below). 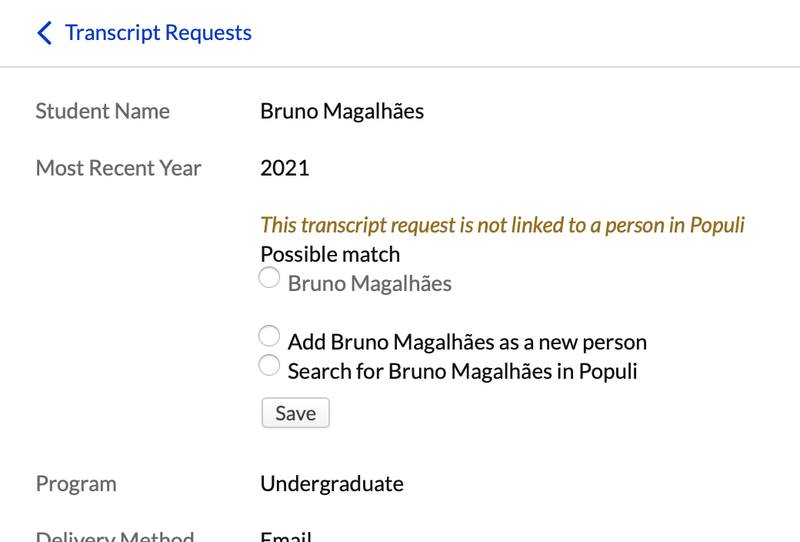 Click a student's name to go to the transcript request info page, where you can fulfill the request and perform other actions. The info page gives you all of the request's details. Mark Complete: Use this if you've fulfilled the request by another method. Mark Incomplete: If you need to re-open a completed request, click this and you can run through the fulfillment process again. View/Print Transcript: This lets you view/download a PDF for printing. Print Mailing Label: For printed transcripts, this creates a mailing label for the recipient using the address supplied in the request. Email Transcript: If you've enabled web transcripts, this lets you email the transcript's URL. Delete Request: This permanently zaps the request. Remember: only delete mistakes (not requests you've fulfilled)! Populi will search for people who may match the student name given in the request. If it did a good job, select one of the people it found. You can add the student as a new person using the information gleaned from the request form. You can manually search for the matching person. If you cannot match the request to a person in Populi, you can still mark it Complete (more on that below)—you just can't run the fulfillment workflow in Populi. If you get a request from a 1960's-era alum whose transcript is stored on microfiche (and not in Populi! ), this enables you to record that he made the request and you fulfilled it without having to back-enter all of his old academic data. Review the transcript request's information. If everything looks good, click Fulfill Request (if there are any problems, contact the student). Select the transcript layout. These are the transcript layouts that are set up in Communications > Page Layouts. If need be, edit the recipient field. Click Next to see the preview. Look over the preview. Don't like it? Click Back to make changes. Like it? Click Next. If you're printing and mailing the transcript, you'll see a link to download the PDF. You can use the Actions menu on the request page to create a mailing label or envelope (see below). If you're emailing the transcript, you'll see a dialog with the email contents. You can change or add recipients, edit the message, choose whether to encrypt the transcript, and choose how to send the transcript password. If you've enabled web transcripts, make sure not to mess with the URL in the email! Click Send and Complete to fulfill the request. Now that you've done this, the transcript request is considered completed. If you need to run it again, go to the request page, click Actions, and select Mark Incomplete; you'll then be able to run back through the fulfillment process.